We were founded by owner Jonti Bolles to provide sustainable, ethical marketing results to small and medium sized businesses, nonprofits and associations. We have continued to grow and be a fun, distributed workforce that is focused on continuous learning and building partnerships with our clients. We successfully provide digital marketing results based on best practices in search engine optimization (SEO), online advertising such as Pay-Per-Click (PPC) and social advertising. We use proven marketing strategy and the latest techniques for optimization of your digital presence. As a business owner, I have built on my experience in finance, architecture and eLearning. As a senior level manager in agencies and software companies, I balanced significant roles in operations and leadership to create great digital marketing teams. With over 15 years of experience (that is like 105 years in online life), we continuously learn and invest in ourselves so we can learn your business like it was our own. We approach every project with value in mind and a design data driven solutions. Balancing the art and science of digital marketing, we bring better brand visibility, increase sales leads, and make it easier for clients to find you online. Tell us about your project and let’s get started. 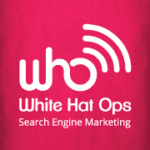 Contact White Hat Ops directly!